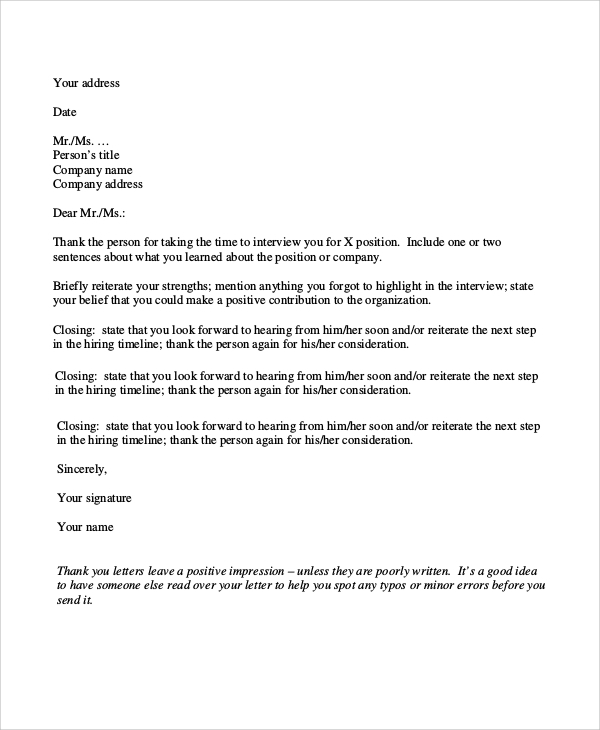 A job interview thank you letter, as the name suggests is what you send to the interviewer after the job interview. 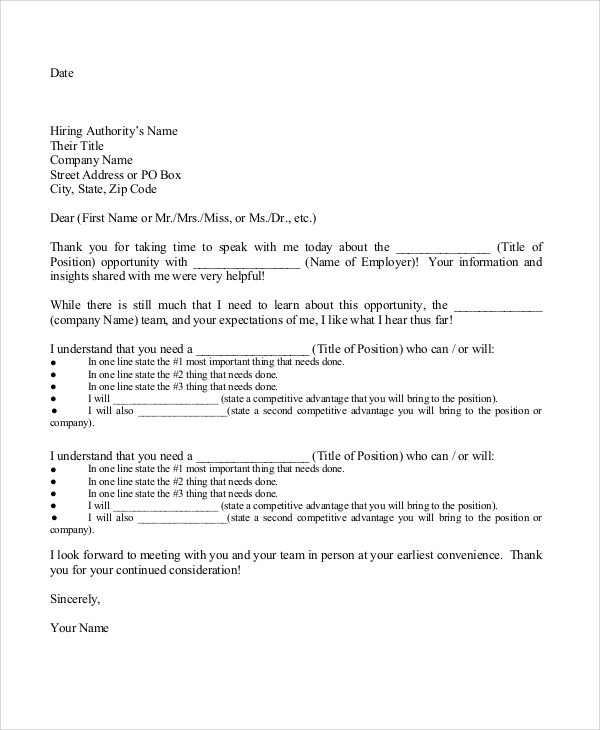 This is the right template that describes the form or format of the letter, and exactly how it can be framed to look decent and fetch you the desired attention. The phone interview thank you letter is what you would send after a telephonic interview. 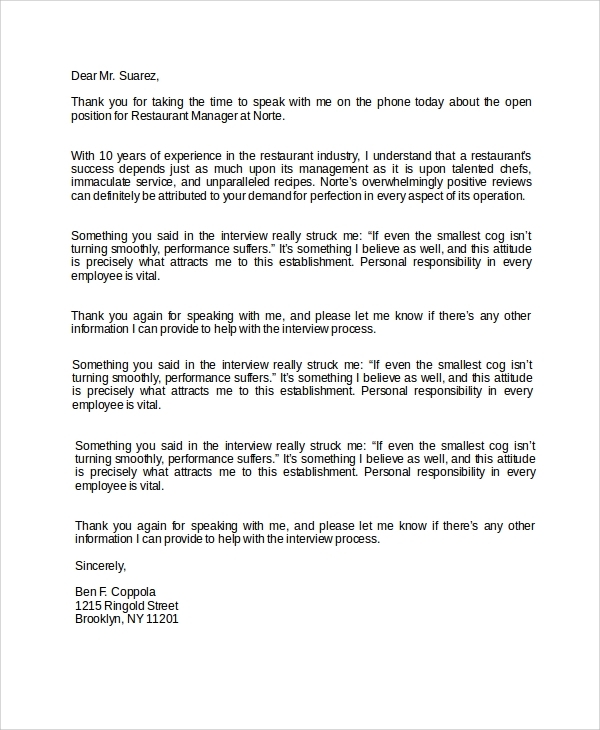 This letter would help you express your gratification to the recruiter for giving the time to evaluate you over the chance to attend the interview. The email thank you letter is what you would use to send your letter of thanks and gratification over the email. 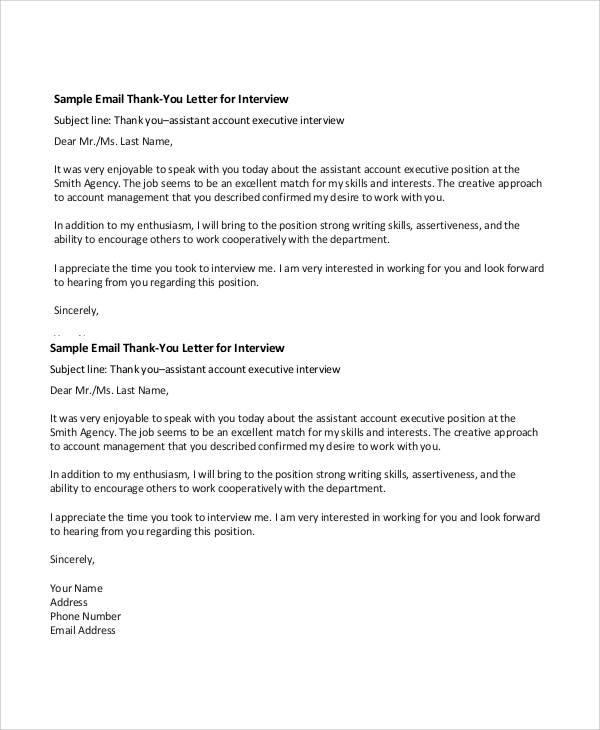 This format is specially suited for the email style, and you may use this simple and clean format to tell the interviewer how thankful you are to get the opportunity and look forward for further communication. 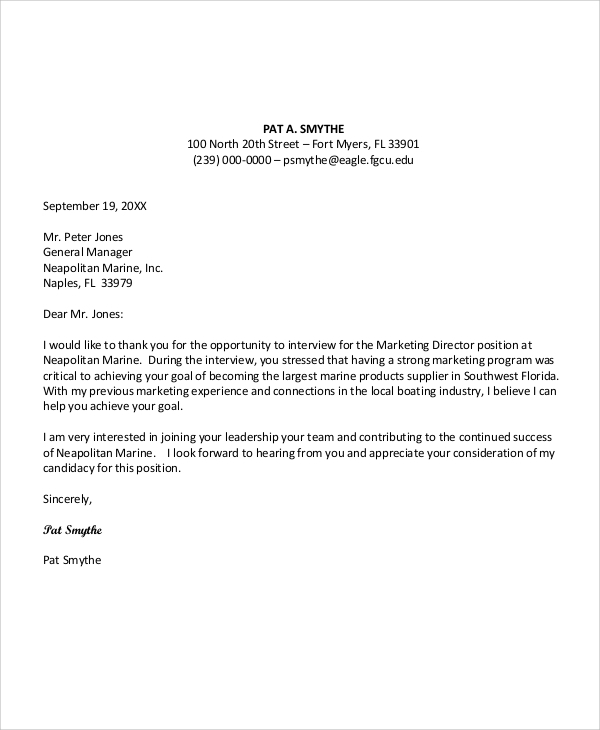 What is a Sample Interview Thank You Letter? The interview thank you card you send in after an interview, determines various factors. An interviewer interviews various people and has to see various faces, and goes through many resumes throughout the day. This goes on for days or hours till the interviews are completed. Now, remembering one particular face may never be more possible. Naturally the interviewer will not remember about you specially unless you had an outstanding performance, or your resume is one of those that stand out from the rest. Hence, to stay ahead in the crowd of other candidates, you may send this thank you letter. The sample is just to tell you the exact standard format that is circulated for use through the globe. 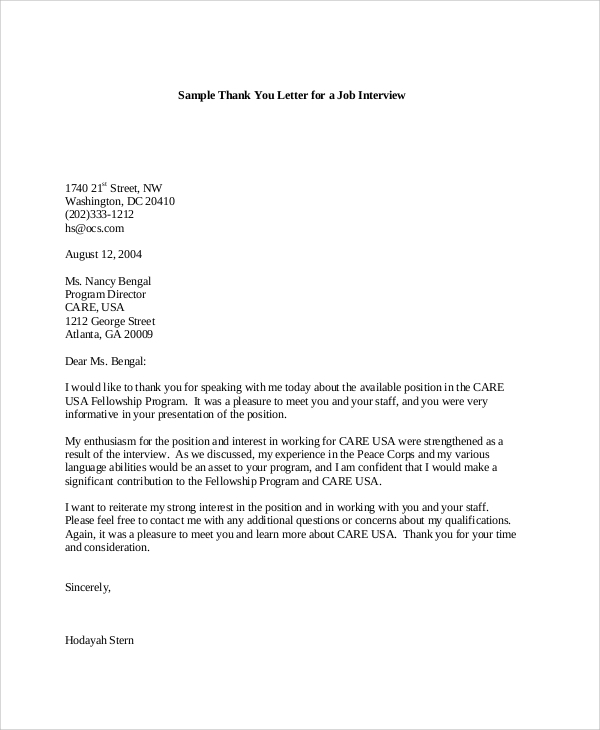 What are the Benefits of Using a Sample Interview Thank You Letter? The first thing is that, a thank you letter shows your gratification. You can actually put a few steps ahead with it. When you say thanks you open a lot of doors for possibilities. The recruiter who may have forgotten about you among many other faces, will suddenly feel good that you took put time to say thanks, and may think of you again. Also the letter pushes the conscience of the employer to think about you on the ground that you cared to reply back after the interview which not all interviewees do. That is why a thank you letter has a special importance. However writing one is not the job for everybody, and would need some assistance in the form of these samples. They are a good reference for your letter writing needs. Using the samples demand that you download the free letter files. You will have to download and read them to understand the pattern demanded. Later you may also choose to use the words suggested by them. These files are available in easy to edit and print formats, mostly in Word. Hence you get no resistance, with their use or editing and may smoothly carve out a thank you letter after an interview to impress your interviewer. 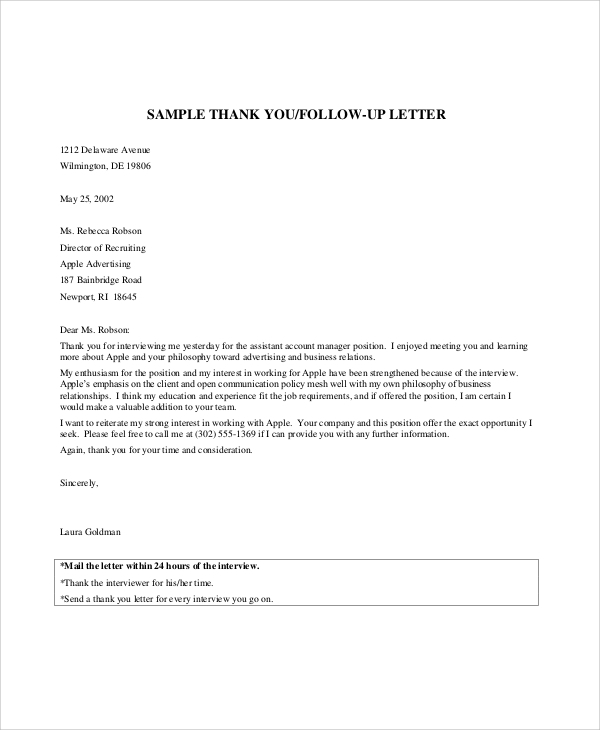 As you are thinking of framing a thank you letter after an interview, you may get help from the various styles of thank you letter samples which are available online from the template banks. A simple download of a Business Thank You Letter Sample or templates would give you the right direction to pen down the letters.